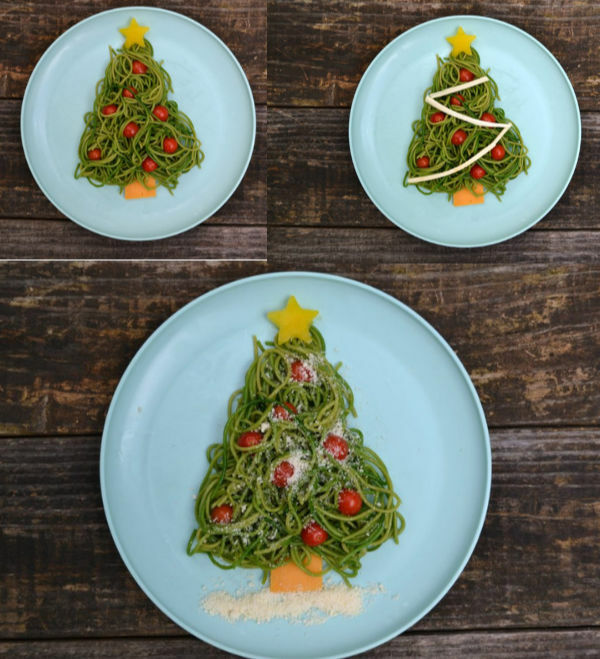 Christmas tree pasta dinner is a fun and simple way to bring the holidays to dinner time. This simple holiday pasta is super kid friendly and uses just a few ingredients. An easy way to bring cheer to an average, December weeknight meal, your kids will love how much fun it is. Add some extra veggies by using hidden veggie pesto sauce or just use butter for a simple version everyone will adore. This post was originally posted on December 3, 2016 and has since been updated. You know, sometimes a good idea comes out of nowhere and you just roll with it. Even if the idea comes in September and it’s an idea revolving around Christmas. When I was creating the post for my spooky eyes pasta lunch box for Halloween, I had a pot full of green noodles. I was scooping them onto a plate to give Ryan for dinner. Let’s be honest, most of my boys’ dinners are blog posts deconstructed, and a magical thought came to mind. 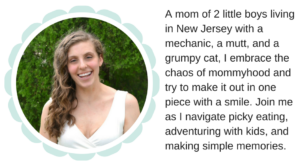 From one holiday idea to the next! Thankfully, I had a few ingredients in my fridge that I thought might work to create one, so I went for it. And OH MY GOODNESS you guys – it’s the cutest darn tree I ever did see. The process is ridiculously easy, which we all know is VITAL for the busy holiday season. And by, “the process is ridiculously easy” I mean my 3 year old could have made it himself so long as I cooked the pasta for him. Yup, THAT easy. First, you’re going to cook up some spaghetti, toss it into a bag and shake it with some food coloring. Just like we did with my favorite Chicken Boo-dle Soup. This is a really fun task for kids to take over! If you want, you can add some pesto right about now – my hidden veggie pesto sauce would be perfect! Then we’re ready to decorate! There’s really no limit to how you can decorate your tree. From a simple snowy version to a decked out one with string cheese garland, the options are endless. I think it would be super fun to make a “tree trimming” party and serve the toppings in different bowls and let kids go crazy. I would recommend shaping the pasta into a triangle for them, especially if you have littles. The options for decorating this Christmas pasta recipe are endless – from star shaped peppers to halved tomatoes to lots of cheese, kids will love these! Plain tree with ornaments and a star. Add a handful to a plate and shape into a triangle. Cut a star out of the bell pepper using a small star-shaped cutter. Add halved grape tomatoes throughout the ‘tree’ to create ‘lights’. (You could use multi-colored tomatoes, but I only had red and like the red/green combo.) Add cheese chunk as tree stem. Tree with Garland. Kick it up a notch by peeling sections of the string cheese and draping across the tree like garland. See? I told you. Easy peasy. I can’t imagine you’ll find another Christmas themed dinner that will be this fun or this easy. You kids will request it every year! I think it would be so fun as a Christmas Eve tradition. Not only is this fun holiday dinner fun, it’s super easy! Make it a family affair by serving it family style with the decorations in separate bowls and letting kids “decorate” their trees themselves! 1 lb of spaghetti I used spinach pasta since my boys would never know the difference. Boil spaghetti until just barely al dente before draining and running under cool water. Drain well and toss into a zip top bag with about 20 drops of green food coloring diluted in about a teaspoon of water before shaking until the color is fully dispersed. Scoop onto a plate and arrange in a large triangle shape. Add a rectangle of cheese as a trunk, and position halved tomatoes throughout your tree as ornaments. Slice a cheese stick into thin lengths and adorn tree as garland. Cut a chunk of bell pepper with a star cookie cutter and add on top of the tree. Sprinkle with grated Parmesan as snow. Looking for more easy ways to encourage your kids to eat more fruits and vegetables? Grab your FREE copy of Eat the Rainbow – 10 fun and easy fruit and vegetable snacks that will take less than 1 minute. Your kids will be begging to eat these fun fruits and vegetables. Okay, so tell me – which version do you like best? When do you start thinking about Christmas? Let me know in the comments! 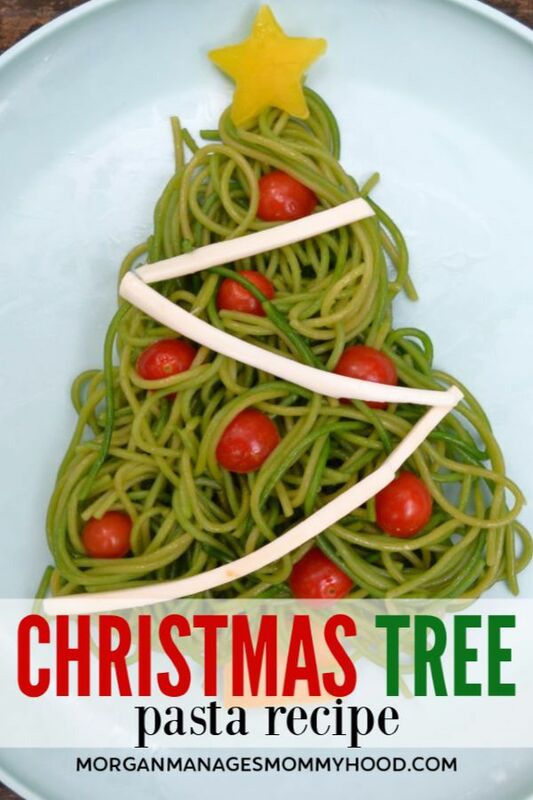 If you like this Christmas pasta you may also like..